Colorful Dinnerware or Dinnerware by Color? Some people like colorful dinnerware as opposed to neutral dinnerware sets, while others like to choose dinnerware by color. At any rate, Dinnerware Shopping Guide has got you covered. If you are a bit like me, you don't go out looking for colorful patterns. Rather, you shop by primary colors and let what you find set the style of the décor, or you let the style that you have decided upon to influence the color and style of dinnerware that you use. Colorful patterns add a cheerful feeling to the atmosphere, whether you are setting a dinner table or decorating a kitchen. I love sharing and reading ideas for table settings. If you have some ideas of your own, please share them with us. I'm sure the visitors to this site will appreciate it. There are many dinnerware manufacturers and brands that are known for producing colorful patterns that will definitely brighten up your kitchen or dining table. Most of these brands or manufacturers produce casual dinnerware sets, except for Versace, which is a dinnerware brand designed by a renowned Italian fashion designer. It mostly consists of fine china dinnerware patterns that are very colorful. 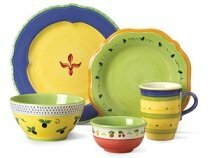 Fiesta dinnerware is made up of solid colored dinnerware, although they do make a few holiday patterns. 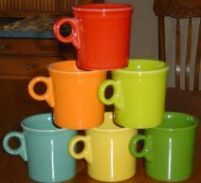 It is collectible dinnerware and has several colors to choose from that have been released over the years. It is perfect for mix and match concepts, if you are into that. Gibson Dinnerware and Home Trends Dinnerware are standard casual dinnerware sets that are comparatively cheap, when compared to other brands of dinnerware. The sets are readily available in shopping centers throughout the country. Pfaltzgraff dinnerware is a long-term producer of casual dinnerware sets. They have many patterns and most are very colorful. They used to have outlets that sold their dinnerware exclusively, but today it is distributed online. Viva Terra is an interesting company that strives to use recycled products to create their dinnerware. The colored glass dinnerware is simply amazing, and it is made from recycled glass. Colorful dinnerware is fun to work with and it makes awesome table settings. It can be used to set the décor, or to complement the décor which makes it a great choice.